On a late-summer morning in Lee’s Summit, Missouri, two buses approached a low-slung building. The warehouselike facility in this Kansas City suburb was actually a branch of the University of Central Missouri, whose main campus was 40 miles away in rural Warrensburg. Nearly 90 percent of UCM students hail from Missouri. But this morning, almost all the 40 or so who hopped off the buses were from India. To get there, some had taken out loans against their parents’ homes; whole families had pooled funds to send over just one student. Wearing jeans, hoodies, and the occasional salwar kameez, they headed to computer science and information technology classes through a pair of double doors, past a looming decal of the school mascot, Mo the Mule. It was two years ago that Poonam Gohil first rode that bus. Petite with a round face and shoulder-length black hair that swoops over her right eye, Gohil had come from Mumbai to get ahead. She’d seen Indian friends leave for the United States and secure good-paying jobs at well-known companies, and she decided to attend UCM because of the school’s relatively low cost—students can earn a master’s degree in computer science for about $15,000. It was still a big stretch, especially since Gohil’s parents had passed away when she was young, but she cobbled together scholarships, awards, and a job at a coffee shop to help pay her way. Gohil arrived on campus as the Indian student population at UCM was skyrocketing, jumping from just 152 in 2012 to nearly 2,500 in 2015—some 17 percent of the university’s student body. The school had become a newly popular destination thanks to a little-known but fast-growing guest worker program called Optional Practical Training, which allows foreign students earning degrees from American institutions to work in their field for a year after graduation. Those with degrees in science, technology, engineering, or mathematics can stay in the United States for up to three years. That’s also how long foreigners can stay under the better known (and more restrictive) H-1B skilled-worker visa, which limits guest workers to the position described on their application and requires companies to pay to sponsor them before they start working, making it difficult for them to switch jobs. The flexibility of the OPT program is one reason why its numbers increased 39 percent between 2014 and 2016, and why nearly two times more OPTs were approved than H-1Bs last year. With more than 300,000 OPTs currently working in the United States, according to the federal government, the program has become a key part of the tech industry’s efforts to recruit globally. Former University of Central Missouri student Poonam Gohil outside her home in Warrensburg, Missouri. Yet like many of her Indian classmates, Gohil was stressed out about the job search. She’d applied for positions with dozens of major companies but secured only a handful of interviews—and no calls back. “It was heartbreaking,” Gohil told me. Meanwhile, she’d started receiving multiple text messages and emails from aggressive contractors at tiny firms she’d never heard of. “Do you have any other good Referrals?” one text to Gohil read. “Text me their Names and Ph Nos.. You will get referral bonus from us…” Others approached Gohil on LinkedIn, asking her to work for them and offering her $1,000 for every person she brought with her. Soon enough, she figured, she’d have to settle for a contract job at one of these cut-rate temp firms. After all, if she couldn’t find an employer to sponsor her OPT, she’d have to go back home to India. 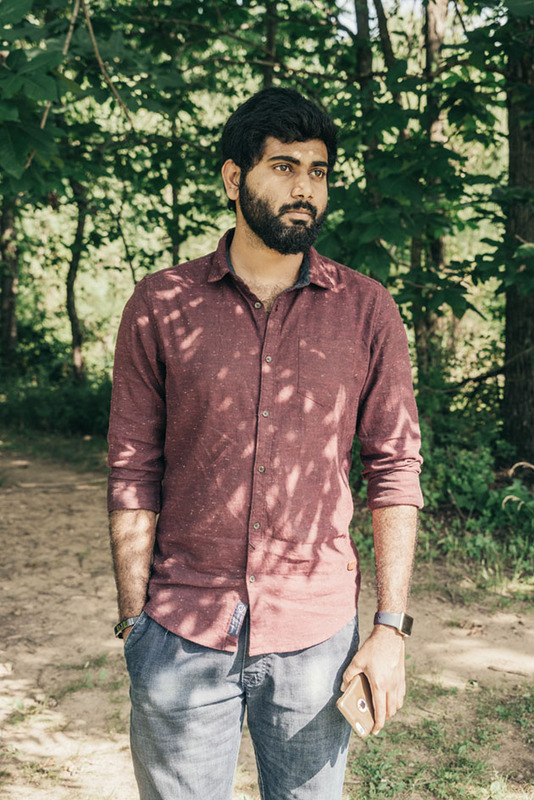 For many foreign students like Gohil, the OPT program has become a pathway into a shadowy world of white-collar indentured servitude. For every graduate who lands a job at Amazon, Intel, or Microsoft, many more end up laboring at small companies known as “body shops” that specialize in contracting tech workers for IT and software development roles at larger firms, usually for short-term projects. Often run by Indian immigrants themselves, the labor brokers entice workers with the claim to make $50,000 or so per year. That sounds pretty good for a new graduate, until you understand what strings are attached. Body shops have long run afoul of federal labor laws. In 2014, the Center for Investigative Reporting found that firms illegally withheld nearly $30 million from some 4,400 tech workers on H-1B visas from 2000 to 2013. CIR also reported that they regularly used restrictive employment contracts to keep H-1B holders from leaving for permanent jobs, and even sued them for quitting, sometimes for as much as $50,000 in damages. (In 2013, the Labor Department cited six tech consultancies for trying to impose illegal penalties on workers who’d left their jobs.) Additionally, the CIR investigation gave an example of a body shop that forced workers to exaggerate or falsify their résumés to make them appear more attractive to large end clients. Now, according to lawsuits involving Silicon Valley-area body shops and interviews I conducted with three dozen foreign guest workers, these practices have spread to the OPT program. But the difference is that universities are willing partners too. Eager to make up for funding shortfalls in the wake of the Great Recession, schools across the country have enrolled larger shares of international students, many of whom pay full freight. Some OPTs believe they’ll be able to pay off their student loans once they score a job after graduation. Although college officials must sign off on a student’s employment, their vetting of companies is so lax that it amounts to a rubber stamp, giving shadowy operators a chance to gain a foothold on campus. For example, a New Jersey-based company named Friendly Consultants Inc. was among the body shops that reached out to Gohil. In the fall of 2015, it was the sole sponsor of the Indian student association’s celebration of Diwali, the Hindu festival of lights, which she had helped organize; during the event, Friendly held a raffle with a sign-up sheet collecting the names, email addresses, phone numbers, and expected graduation dates of dozens of students. Gohil never returned Friendly’s messages. A few weeks after I spent time with her in Warrensburg, she texted to let me know she’d finally landed the interview she’d been dreaming about: Amazon. The company had an opening for an entry-level software development engineer, and she was flying to Washington, DC, in two weeks. If all went well, she’d start the new gig in the summer—and put Friendly and the other body shops behind her. When UCM turned to international recruiting around 2010, administrators knew what Indian students were looking for: instruction in STEM fields, then an OPT, and then, in a best-case scenario, an H-1B. (Of the 85,000 H-1B visas offered each year, 20,000 are reserved for people who have earned a master’s degree or higher from a US institution.) According to Mike Godard, UCM’s vice provost for enrollment management, the school hired several carefully vetted education agents in India to direct students to UCM. But the 1,500 percent increase in Indian enrollment at UCM still shocked university leaders. “I don’t think anyone in their right mind would have predicted that type of spike,” Godard said. University of Central Missouri student Vicky Reddy near Lions Lake in Warrensburg, Missouri. 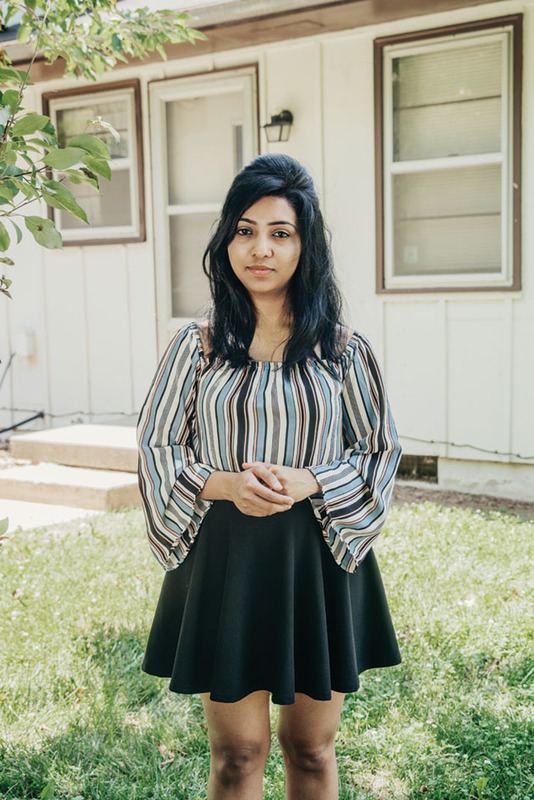 One of those students is Pradyumna Reddy, a rangy, stylish industrial-management major from Hyderabad who goes by the nickname Vicky and lives in a two-bedroom apartment with three roommates near UCM’s Warrensburg campus. When I visited in the spring, Indian students were renting all six units in his building, and all of them were OPT-bound. Vicky shared a room with a computer science major, and their beds consisted of two piles of blankets arranged within a few inches of each other on the ground. The apartment’s lone luxury was a new smart TV sitting on the box it came in; the walls were bare save for a map where Vicky had traced the routes he’d driven in the used Chevy Cruze he bought when he moved to Missouri. In the kitchen, there was a rice cooker, a pile of dishes, and a 50-pound bag of onions from a restaurant-supply store in Kansas City. Onions, Vicky explained, are expensive at Walmart. According to data I requested under the Freedom of Information Act, UCM ranked 26th in the number of approved OPTs in the workforce since 2011, behind elite schools like Columbia and Carnegie Mellon. But also ahead of UCM in the rankings was Northwestern Polytechnic University, a California school that BuzzFeed exposed in 2016 for enrolling thousands of foreign students—making up 99 percent of its student body—but having no full-time, permanent faculty. While graduates from name-brand schools frequently found their way to Fortune 500 companies like Goldman Sachs, Microsoft, Google, and Apple, UCM graduates seem indistinguishable from those who attended Northwestern Polytechnic—both often move straight from the classroom to obscure tech firms. 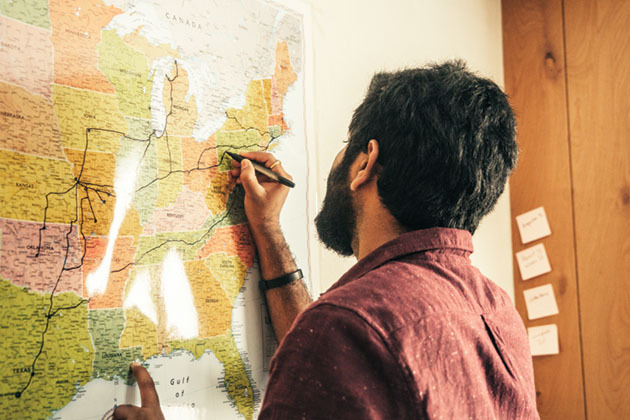 Vicky Reddy records his travels throughout the United States on a map at home in Warrensburg, Missouri. So how do OPT students—and the companies they work for—fare? When Chetan Reddy Kottur graduated in 2011 from Southern University, a historically black college, he immediately set off for a Dallas-area body shop called Saxon Global. The company gave him temporary housing near its office, placing him with five other Indian guys in a two-bedroom apartment. He slept on the floor in what would have been the dining room for months. During that time, he says, he fabricated his résumé because he believed that’s what was expected of him. (According to a former employee of an Atlanta-based body shop, inflating guest worker experience is rampant in the industry.) Saxon marketed Kottur as a business intelligence developer, claiming he had previously created reports using companies’ internal data to improve their decision making. During the presidential campaign, Donald Trump repeatedly hammered the tech industry for relying on immigrants—particularly those with H-1Bs. He singled out Disney for laying off portions of its workforce after signing outsourcing contracts with a large Indian IT services company—and forcing the pink-slipped workers to train their H-1B replacements. Demand for H-1Bs has far outstripped supply in each of the past five years, which is why the Depart­ment of Homeland Security hands them out via lottery: In 2016, there were a record 236,000 applications for just 85,000 new visas. In April, Trump ordered a review of the visa-granting process, and though any real changes will require Congress to pass legislation, his rhetoric appears to have had an impact. There were 37,000 fewer H-1B applications filed for the 2017 lottery as compared with 2016. Yet for all the debate raging over H-1Bs, the OPT program—which has no enrollment cap—has flown under the radar to become the surer, bigger path for Indians to temporarily work in the United States. Recently, Pravin Rao, the chief operating officer of outsourcing firm Infosys, told India’s Economic Times that his company (which has secured thousands of H-1Bs over the years) was now “looking at hiring from more colleges in the US.” Instead of facing the scrutiny that goes with importing midlevel workers from India, it could use the OPT program to take advantage of resources already in the United States. Meanwhile, Poonam Gohil will be one of thousands of OPT students looking for work this fall: When I checked back with her, she told me she didn’t get the Amazon job. Worse, her employment authorization card was due in mid-July; at that point, she’d have just a few months to secure an employer. Otherwise, she’d have to return to Mumbai. This article was supported by an Ida B. Wells Fellowship from The Investigative Fund at The Nation Institute.